Pineapples, peas, mini red potatoes, black beans, red bell pepper and….Depeche Mode. Yeah that’s right! I like Depeche Mode. I also really like George Michaels tune "Freedom" too. Yeah so! 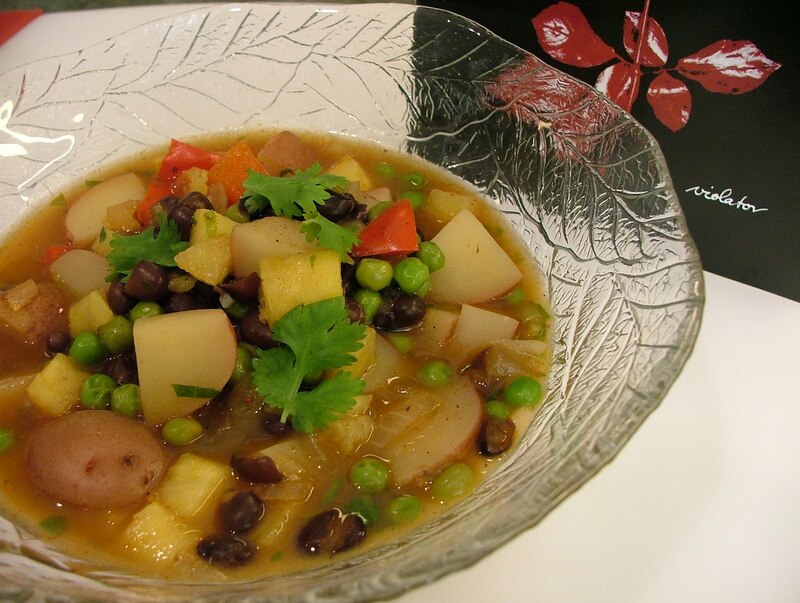 This sweet and savory vegetable stew is also a favorite of mine. Want to know what else…I used chicken broth instead of vegetable broth to make it. As you may have noticed I’m writing this post with a very strict policy of openness and truth. This straightforwardness all started when I began to prepare this dish listening to Depeche Mode’s “Music for the Masses” CD (whoa what a bunch downer songs on that one). I quickly made a DP substitution and went with the tried and true “Violator” CD. Ahhh much better songs! “World in My Eyes”, “Personal Jesus”, “Enjoy the Silence” and of course “Policy of Truth”. That’s where my openness really kicked-in. Would you like an example? O.K. let’s start with dish. I call it a “pimp the cookbook” recipe. You know why? Because it’s out of The Cook-a-Palooza Experience cookbook. What? There’s a cookbook? Yes there is and all the recipes are excellent! I can’t lie so it must be true…well at least from my perspective. I’m sure (no I’m not) you’re all going run and order your copy now! I wasn’t originally going to pimp the cookbook (yes I was) but this blog post sort of went in that direction as I didn’t feel like creating a new dish the other night. Sometimes what you already know is a nice way to go! At first glance it may seem there are a lot of instruments, I mean ingredients, to pull this one together but believe me when I tell you this recipe comes together in a hurry. Did I mention only a single pot is required? Oh how I sincerely love one pot dishes. 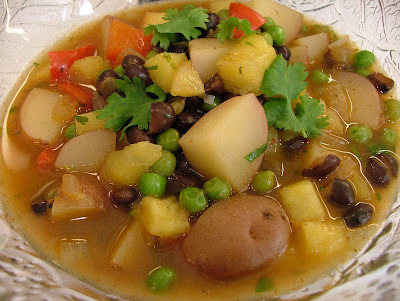 To be frank, what I’ve always liked about this stew is its worldly blend of flavors. If you’re truly looking to take a break from the regular “beef stew” then set your sights on this captivating vegetable version. It’s so hearty you’ll forget there is no meat. Honest to goodness I’m telling you the truth! You believe me…don’t you? In a deep 10-inch skillet, with a tight fitting lid, heat oil over medium heat. Add onions and red peppers. Cook and stir until peppers begin to soften, about 4 minutes. Add garlic and ginger. Cook and stir for 1 minute. Sprinkle in flour, chili powder, cumin, cinnamon and paprika. Cook and stir for 30 seconds more. Stir in vegetable broth and then add potatoes, salt and pepper. Bring to a boil. Reduce heat to low and simmer, covered, for 20 minutes or until potatoes are tender. Stir in black beans, pineapple, peas, cilantro and lime juice. Cover with lid and cook for 5 minutes more. Remove from heat and let stand for 5 minutes before serving.